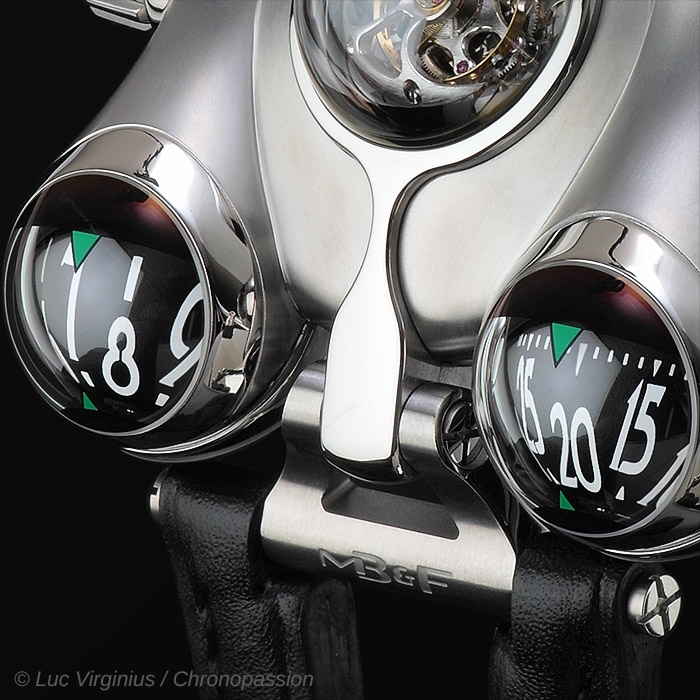 MB&F | 220'000 € Tax inc.
Space is an extremely hostile environment. To survive you need protection against powerful accelerations, dangerous thermonuclear radiation, extreme temperature fluctuations and constant risk of unexpected collisions. 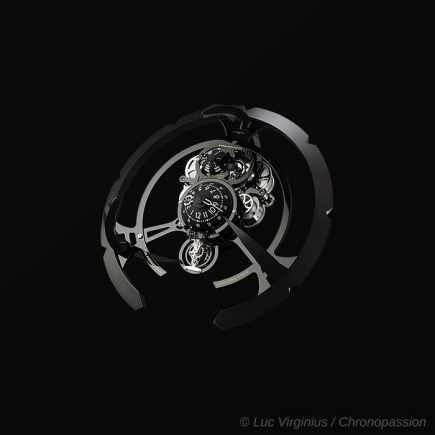 Horological Machine N°6 (HM6) ‘Space Pirate’ has been designed to operate in the hostile environment of space: the space on your wrist. 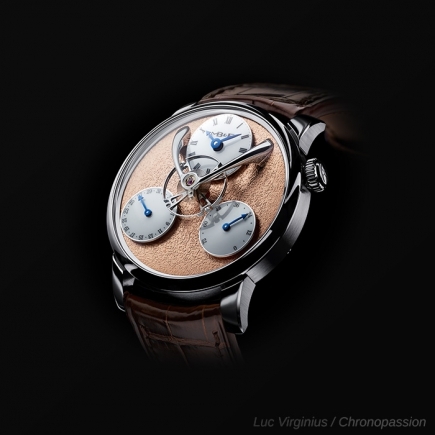 In each of the four corners of HM6's biomorphic case is a 360° sphere, capped top and bottom by transparent sapphire crystal domes. 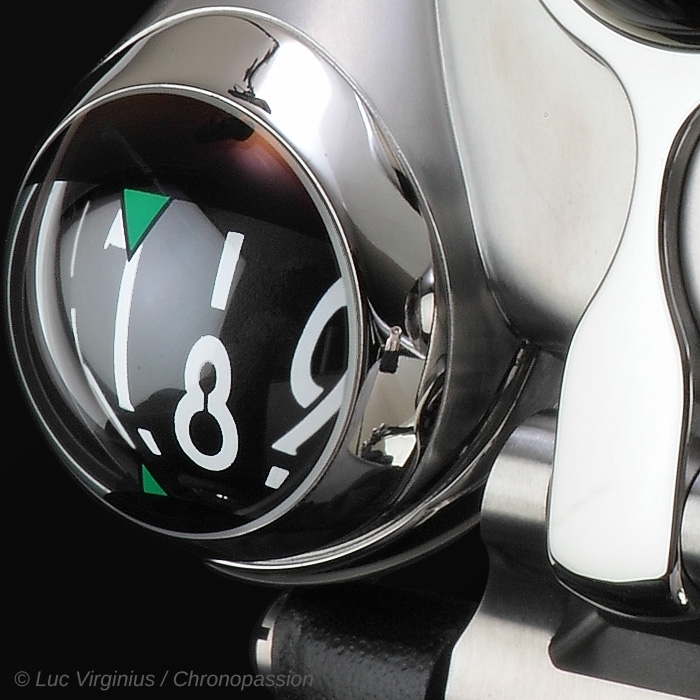 Up forward, two semi-spherical indications rotate vertically (90° to the Engine), respectively displaying hours and minutes in large, highly legible numerals. Back aft, driven through multiplying gearing by the automatic winding rotor, twin spherical turbines spin horizontally, automatically regulating the winding system in case of excessive speed to reduce stress and wear. 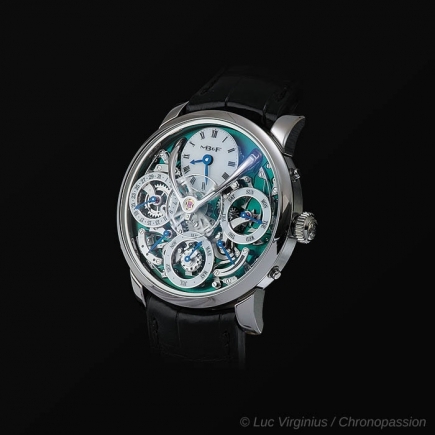 The central dome houses a 60-second flying tourbillon, the precision regulator of HM6's Engine. 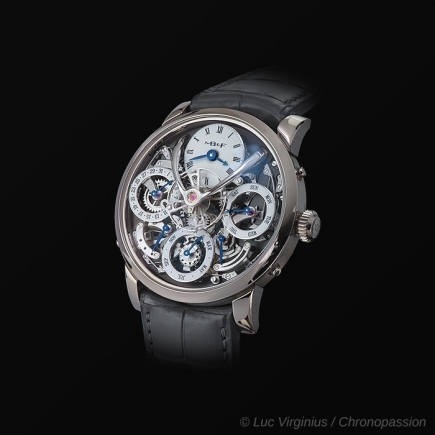 The flying tourbillon is functional − the fact that it looks sensational is a bonus. 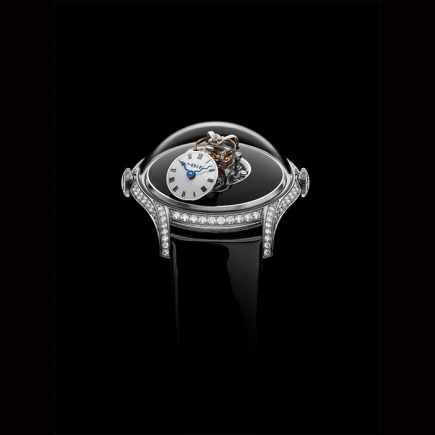 There is no room at the top of the domed crystal for an upper support bridge and a flying tourbillon requires no upper bridge. A case of function following form. But, a transparent dome on a spacecraft – even a spacecraft of the wrist – offers the control cockpit little protection from the sun's destructive thermonuclear radiation. So Space Pirate has a retractable, semi-spherical, titanium protective shield. When closed, the cover blocks harmful rays (especially UV light) from prematurely oxidising the Engine's lubrication oils. A crown at 9 o'clock opens and closes the cover in – and like – the blink of an eye. 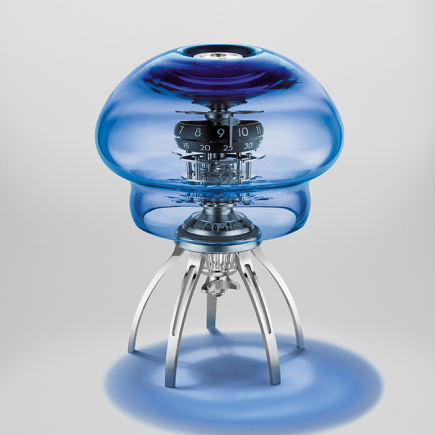 While the transparent cupola on top of HM6 Space Pirate offers a tantalising glimpse into the sophisticated Engine below, the sapphire crystal display portal on the back reveals more of the 475 finely finished components making up the highly complex movement, which required over three years of development. 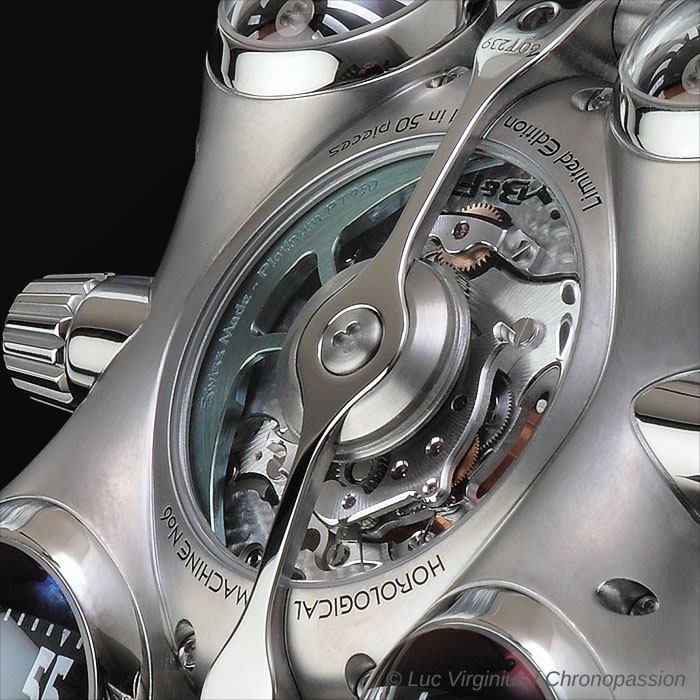 Also visible through the display back is part of the winding mechanism and the high-grade platinum 950 winding battle-axe rotor. 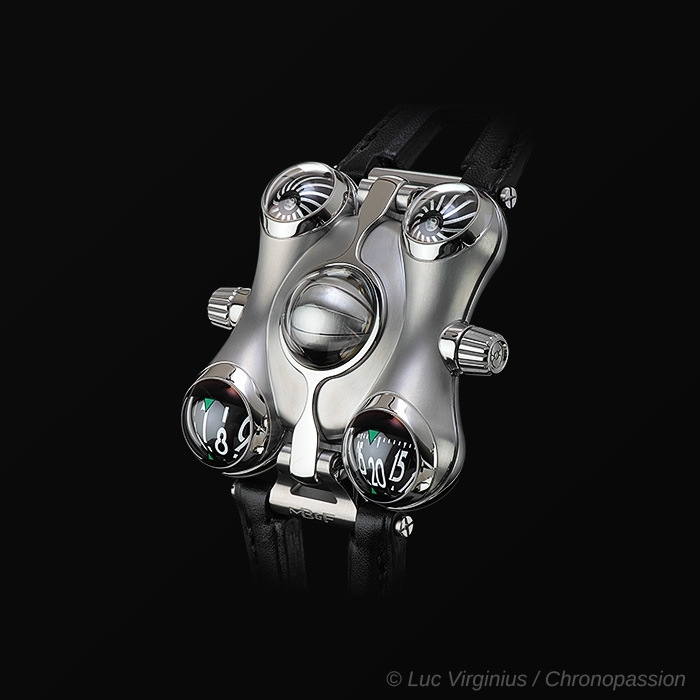 While Horological Machine N°6's gentle curves and bulging "eyes" may give it the appearance of a friendly extra-terrestrial life form, the strength of its exoskeleton is formidable thanks to the aeronautic grade Ti-6Al-4V titanium case, a metal stable at over 400°C. A titanium brace runs longitudely around the central circumference of the hull, reinforcing the structure and supporting the lugs. With its lightweight titanium case and spherical corners, HM6 comfortably hugs wrists of all sizes. 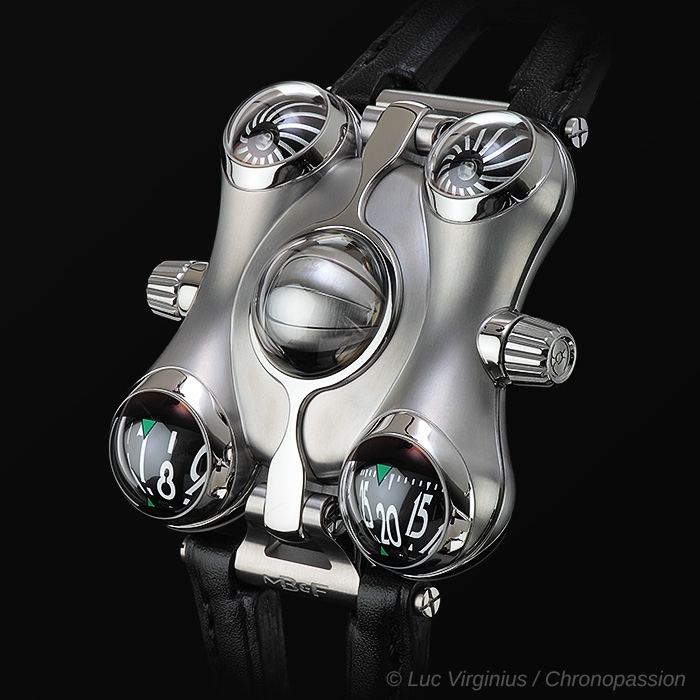 Horological Machine N°6 ‘Space Pirate’ is a limited edition of 50 pieces in Ti-6Al-4V titanium. 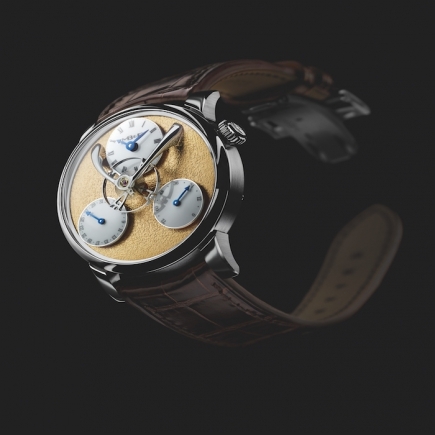 There will only be 100 HM6 movements made in total. The initial inspiration for HM6 Space Pirate came from a Japanese anime TV series from Maximilian Büsser's childhood: Capitaine Flam (Captain Future in English). Capitaine Flam had a spaceship called the Comet that consisted of two spheres joined by a connecting tube. Büsser imagined combining two such craft and the seeds of Space Pirate were planted. 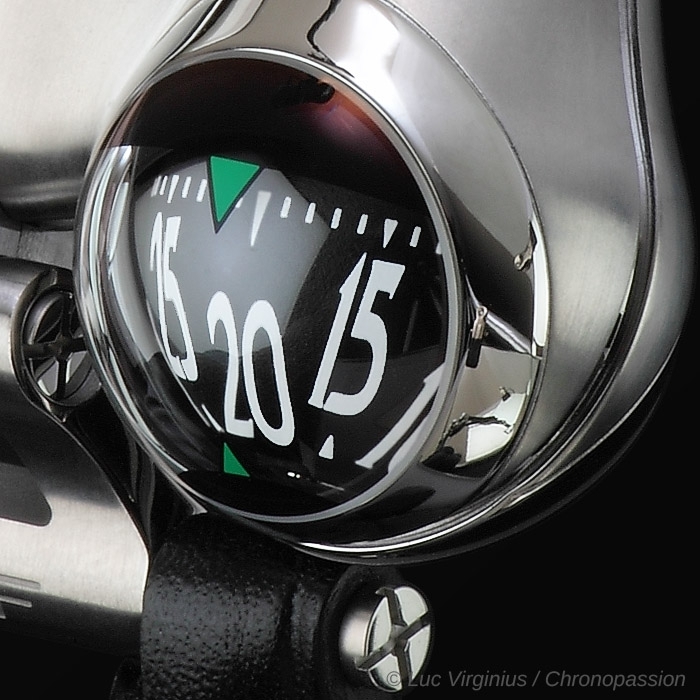 The curved lines of Horological Machine N°6 make it a softer, more organically shaped Machine than its predecessors. 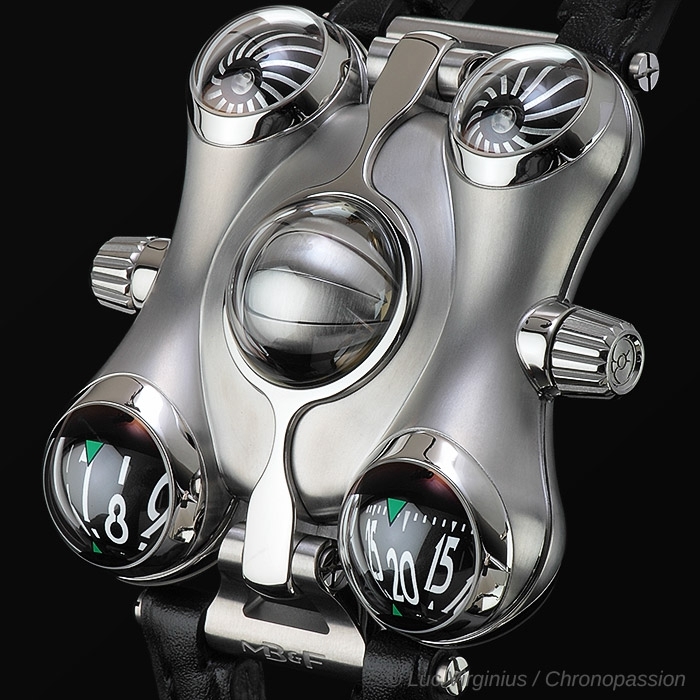 The inspiration for this came from the biomorphism art movement, which takes its cues from design elements based on the shapes of living organisms. The Engine of HM6 required more than three years of development due to the demanding challenges that had to be overcome. The aluminium indication domes displaying hours and minutes are machined from solid blocks of metal to an ultra-light paper thickness and revolve on ruby bearings. The domes rotate vertically, i.e. 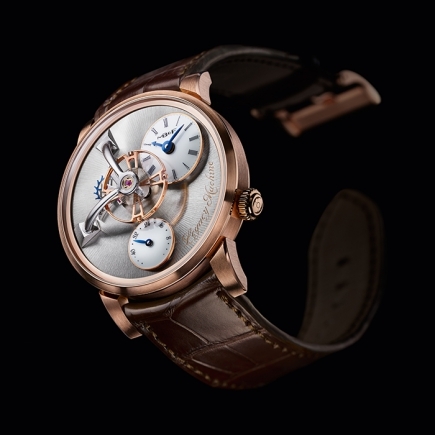 90° to the plane of the movement, which is extremely rare in a wristwatch due to the complexity of the drive train and gearing required. 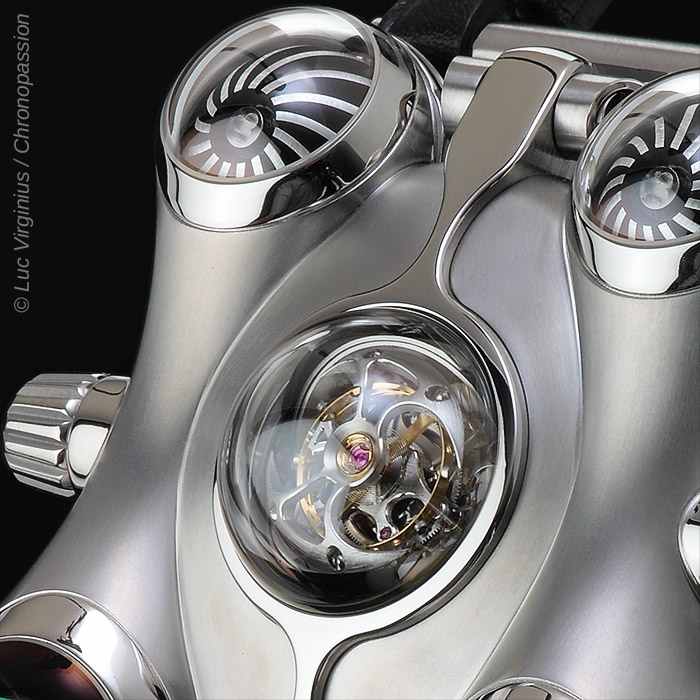 The flying tourbillon can be protected from UV radiation, which speeds up oxidation of lubricating oils in the escapement and movement, by a retractable spherical shield that envelopes the tourbillon with six overlapping, curved blades operated by a crown on the left side of the case. These blades are paper-thin and had to be machined from a solid ingot of titanium. The two spherical turbines, each composed of no fewer than 15 curved vanes, are each machined in two hemispheres from solid blocks of aluminium. These turbines are driven from the rotation of the automatic winding rotor by a gear train designed to amplify the number of rotations. As (air) friction increases exponentially (squared) as a function of velocity, if the winding starts rotating too quickly – most likely due to highly active movement of the wrist – air friction on the turbines increases and helps counteract the excessive speed to minimise wear. 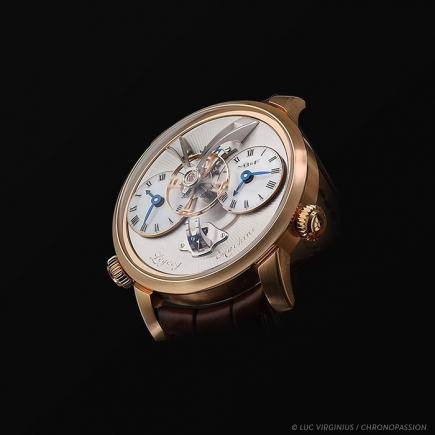 As may be expected with such sui generis movement architecture, nearly every component and mechanism had to be developed from scratch specifically for Horological Machine N°6. The result speaks for itself. The case of HM6 Space Pirate was machined from two solid ingots of aerospace grade Ti-6Al- 4V (Grade 5) titanium. It has a chemical composition of titanium alloyed with 6% aluminium, 4% vanadium, 0.25% (maximum) iron, and 0.2% (maximum) oxygen. This high-tech titanium alloy is both strong and light, has high resistance to corrosion and low thermal conductivity. 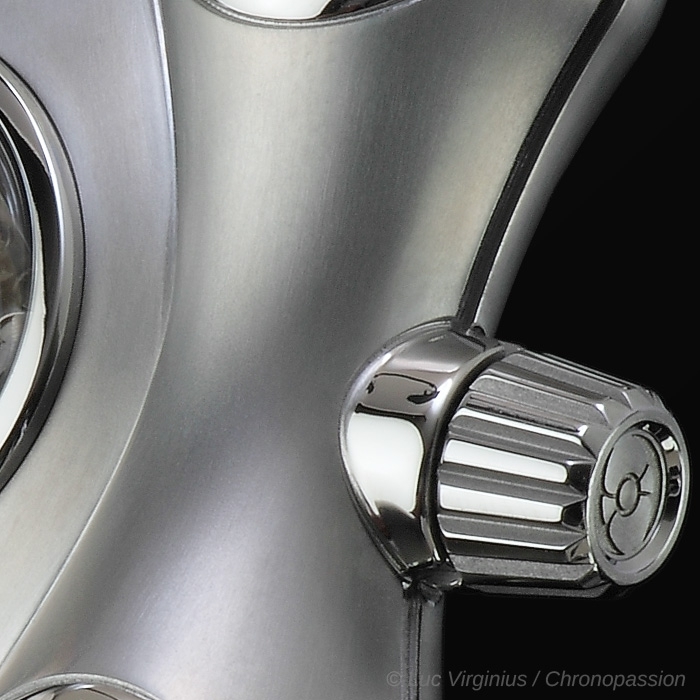 While the strength of this titanium alloy makes it ideal for a space-age watchcase, polishing and satin finishing Space Pirate's complex curves requires more than 100 hours of work. 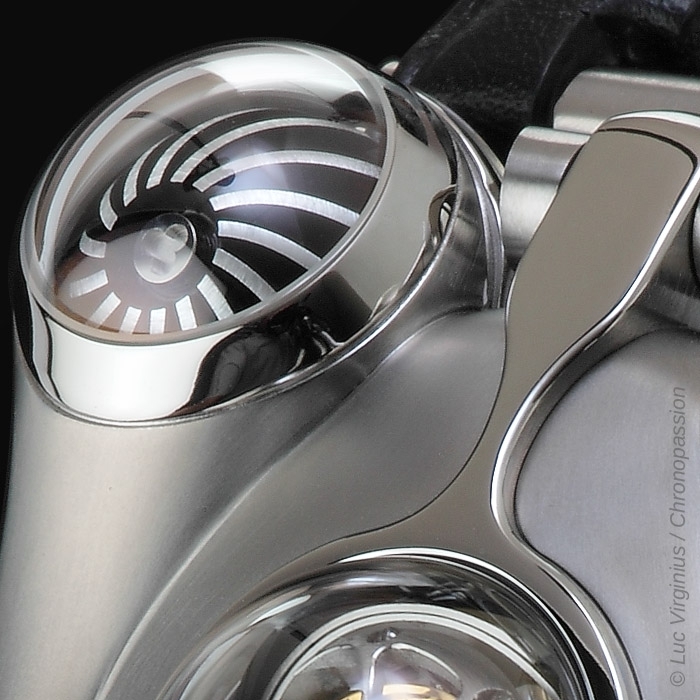 A titanium band wraps lengthways around the case, with a circular aperture on top circumventing the central dome. 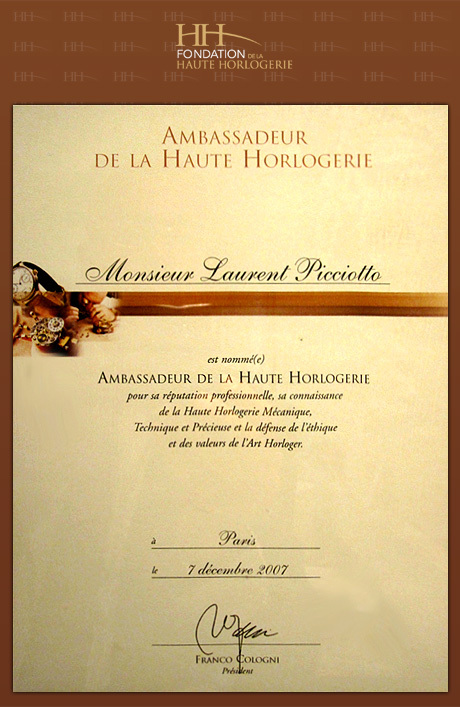 On the back, the flat band is fixed to a metal disc in the centre of the display back crystal. This band both strengthens the case as a whole and acts as a support to the free moving lugs. The pivoted lugs enable the strap to fit snugly around the wrist and, along with the lightweight titanium case and form-fitting spheres in each corner, ensures that HM6 is an extremely comfortable watch to wear, even on smaller wrists. 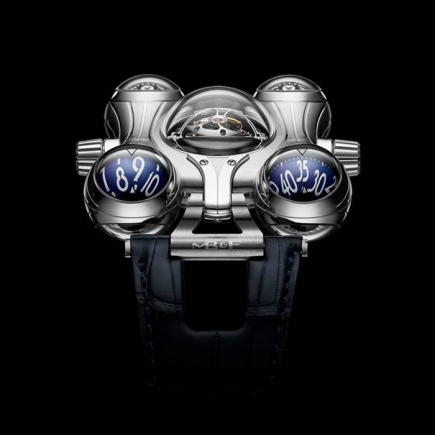 The organic curved lines of Horological Machine N°6's case derives from an early 20th century art movement labelled "biomorphism", in which art is modelled on the naturally occurring shapes and forms found in nature and living creatures. Biomorphic expressions can be found in art: Matisse's eminent work, Le bonheur de vivre (The Joy of Life); architecture: The Sagrada Família church by Gaudí; and the work of contemporary designers including Marc Newson. 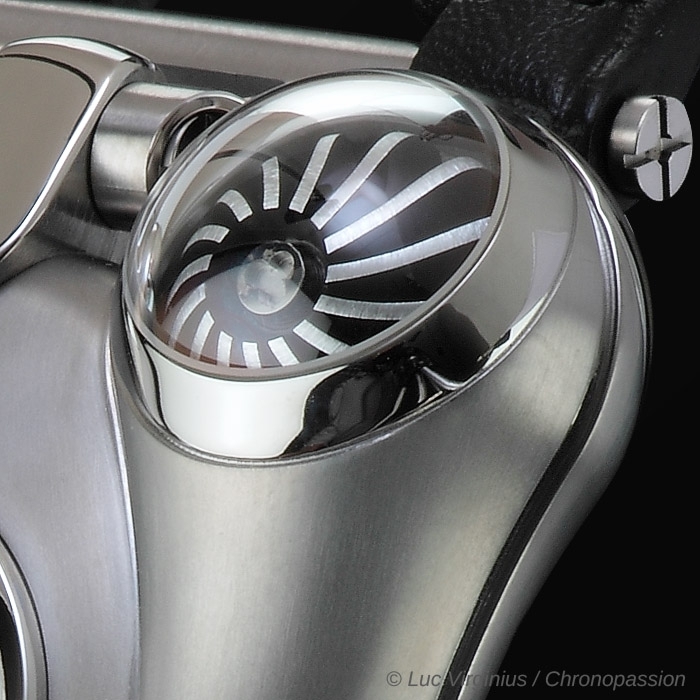 But few have been as influential or as passionate about biodynamic forms as German industrial designer Luigi Colani, whose oeuvre spanned cars, furniture, electronics, a grand piano and even a ballpoint pen. With an incredible ten sapphire crystals, including two domes each (top and bottom) on the time indications and turbines, the Space Pirate posed quite a challenge. 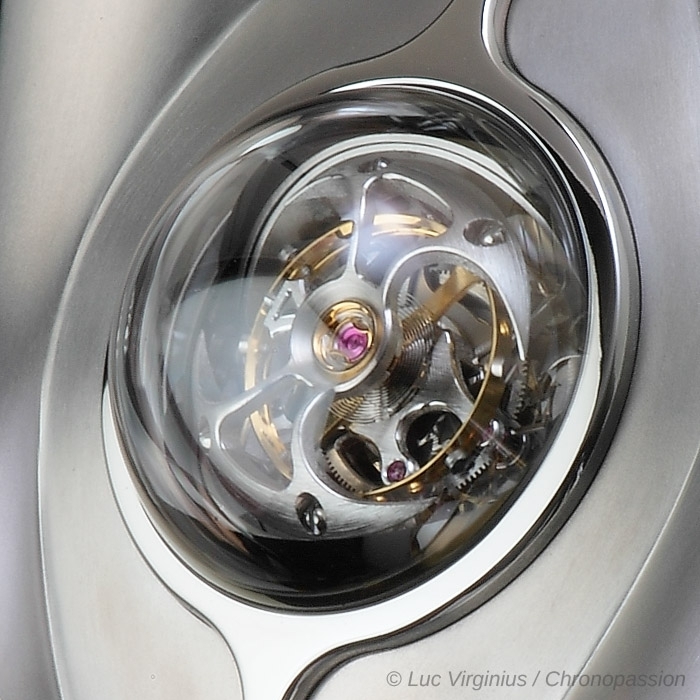 Each dome was first machined from a solid block of sapphire crystal. After diamond, sapphire crystal is the second hardest naturally occurring mineral on earth and is an incredibly demanding material to shape into complex forms. After machining each block of sapphire inside and out with diamond tipped tools to create perfectly shaped domes with walls of uniform thickness – the slightest inconsistencies would result in disconcerting optical distortions – the domes, which are translucently frosted after machining, have to be highly polished, both inside and out, to make them transparent.